I cannot upgrade the firmware form Windows 10. It just say "No device connected". Just tried it on friend's laptop with Windows 8 and same issue... hopefully we'll get a solution soon was hoping to play around with it this weekend but doesn't seem like that'll happen. This could be an issue with the missing digital signatures for the Cactus drivers. Installation on Windows 7 is straightforward, but starting with Windows 8, Microsoft have made it harder to install drivers that are not authorised by them. Try following the instructions to install the Firmware Updater for Window 8/10. (ignore the bit about a "missing libusb0.dll"; you should try the procedure even if you don't see that error message). There is some rebooting involved, but it should work in the end. Does that include the digital signature trick? 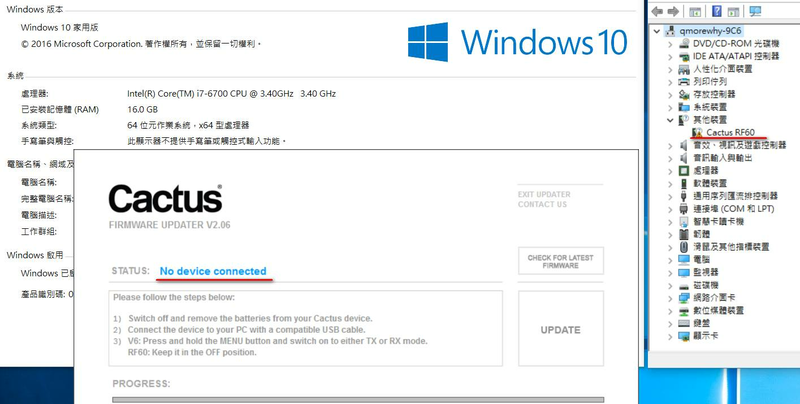 After restarting, you will be able to install the Cactus Firmware Updater normally. During installation Windows will display a warning message, click Install this driver software anyway. Thanks in advance for confirming. Thanks for the input everyone - a little frustrating not being able to use your new toy! I have forwarded to R&D. Maybe Windows 10 had updates that changed how we could bypass it? Anyhow we have been working on the official method, without the workarounds. I hope we will have that sorted out soon. Yes we hope to fix this ASAP, @hector. I just tried it on my Windows 7. Note that before the installation starts, it will first uninstall your existing Updater. Try and see if it works. I still try this but it is not works in Windows 10 (i try four times) this. we have another way for that? So what was prompt on screen during the installation? Or was the install smooth, and you only had problem when plugging in the RF60? Missing USB driver still? When you install, did it prompt you to first uninstall the existing Updater? Maybe we should consider making that the official Windows 10 version... haha. Thanks for reporting. We tried on multiple computers in our office and it worked just fine as well. @christianalencar, can you confirm it's not working on yours? Please share the prompt windows you see so we can find out what may have went wrong. Do check if your anit-virus program may pop up and blocked it. I had the same problem as the original poster. Installed the beta version which managed to find the flashgun but would only install firmware 204 and not 207. The latest firmware I get every time I click on check for latest firmware is 204. How can I get firmware 207 please? I replied you email. Please check. may be it´s "an old hat",but anyway: I just wanted to confirm that the "Workaround" from Antonio postet on Sept. 6th worked with my RF60 under Win 10 absolutely smooth. We uploaded a new version of the Updater and it should now work right off the bat.